Saccone-Jolys & Online Personalities: Why The Hate?! As you may be aware, I have recently ventured into the world of Vlogging ... in doing so, I have started to watch some vloggers to get a feel of what it's all about. At the moment it's all pretty new to me, but one channel I have really been enjoying since discovering it a few months back is The Saccone-Jolys. For those who are not familiar with them, they are a young couple Jonathan & Anna from Ireland who have a baby daughter Emilia and a second child on the way - The Saccone-Joly's are MASSIVELY popular You Tube stars - they have 304,177 subscribers at present and each of their videos receives thousands upon thousands of views and comments. The Saccone-Joly's vlogs go live each day at 6pm - they are just little glimpses into the daily life of a young family - nothing more, nothing less. Jonathan is very animated and amusing to watch, Anna is stunningly beautiful and their baby daughter is very sweet and at the age where she's doing a lot of funny little things which make for great viewing. Watching their vlogs is a great way to just kick back for 15 minutes or so and unwind....I find it very similar to watching a show on E! The vlogs are very much along the lines of a Kardashian style reality show - but instead of watching annoying z-list celebrities (Though I do LOVE The Kardashians, sorry...its a guilty pleasure!) you're watching a real family living a real life. So all in all - this is very much an innocent, light hearted bit of entertainment, right?! So imagine my surprise when out of interest I scrolled through the comments section on one of their videos. Amid many sweet sentiments and words of support and admiration lurked something much darker....comments full of hate and anger, insults thrown at the family...some even aimed at the baby! Spiteful words from some very bitter and twisted people trying to bring into question the couples parenting skills - based on what, a 20 minute glimpse into their day?! Hardly the most unhealthy of take away choices to make, and ...erm.....WHO CARES?! 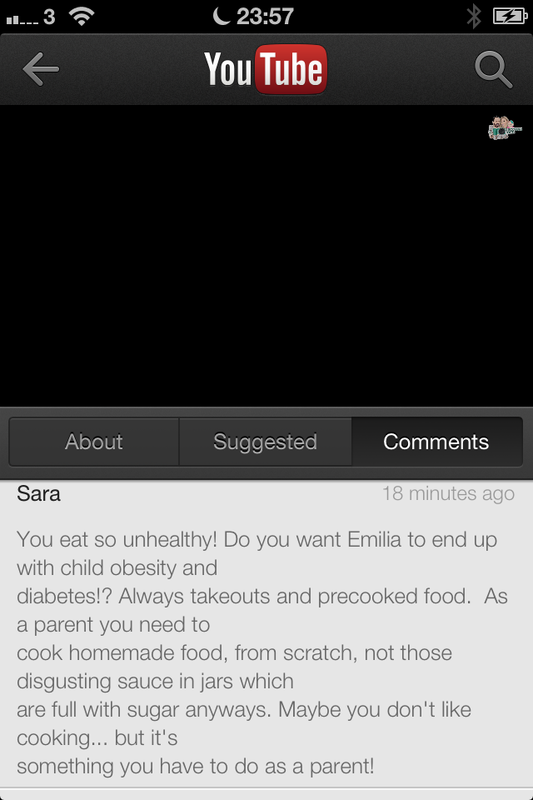 Why do people feel the need to pass judgement on these people based on what they choose to eat?! Why would any sane person care?! And why do people, MANY people in my experience, feel that when a couple become parents people automatically have the right to judge their choices regarding the upbringing of that child? Condemning parents food choices, lifestyles, etc. Nobody is perfect, there is truly no such thing as a perfect parent - all of any of us can do is our best to ensure that our kids are loved, educated and cared for - anyone viewing these videos can clearly see that Emilia is a very well loved and looked after little girl. She certainly doesn't look malnourished or obese, and she seems to be very happy and content. So why all the hate?! At the end of the day, these are YouTube stars - if you don't like what you see, hit the unsubscribe button and don't watch! It really is THAT simple. Much like the hate that is so often aimed at celebrities, again - if you don't like them, don't read about them! Turn the page! Turn over the TV! Turn off the radio! Calm the hell down and save yourself the heart attack! Do people really have so little in their lives to worry about that what a You Tube or TV personality is doing can bother them so much?! 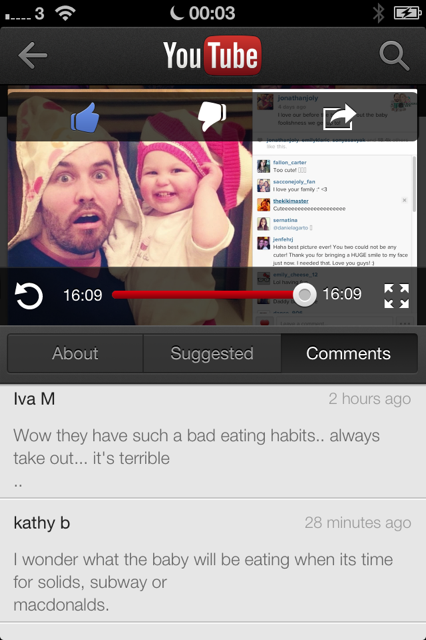 I've never watched their vlogs before but why anyone would give a damn about their eating habits is beyond me. I think Tanya Burr had similar comments a while ago, I remember reading lots of hate about her. It's so silly.